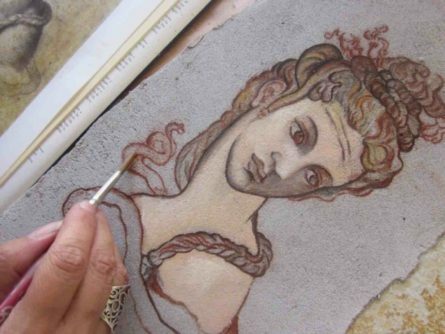 Dating back to the 11th century, the fresco painting technique has been employed by many of the most recognizable names in Italian art history. Learn the tricks of the trade of this intricate process during an exclusive private Fresco Workshop. This hands-on class at an artist’s studio is perfect for families and is ideal to adults and kids alike! Fresco literally translates to “fresh” in Italian and entails painting with water-basted pigments on fast-drying damp plaster. Mastering this technique was considered the true test of an artist’s skill, because trick is to finish painting before the plaster dries. There are hundreds of frescoes and one-offs to be found in Italy, and some of the best are in Florence. The Brancacci Chapel in Santa Maria del Carmine, and the Spanish Chapel inside Santa Maria Novella, painted by Andrea di Bonaiuto, are some glorious examples. You’ll begin with an overview on the art of fresco, learn about its history and importance in Italian art, then create one yourself, after learning from a local artist. Master the techniques, draw and transfer a cartoon, then finally, how to apply the paint. When finished, take away your very own one-of-a-kind souvenir to bring home!